Winco LDI-2 Stainless Steel 1-Piece Ladle 2 oz. TigerChef > Smallwares > Kitchen Utensils > Cooking and Serving Ladles >< Stainless Steel Ladles > Winco LDI-2 Stainless Steel 1-Piece Ladle 2 oz. $0.76 Winco LDT-1 Stainless Steel 2-Piece Ladle 1 oz. $0.99 Winco LDS-3 Stainless Steel Short Handle 2-Piece Ladle 3 oz. $3.49 Winco LDT-32 Stainless Steel 2-Piece Ladle 32 oz. $1.69 Winco LDS-6 Stainless Steel Short Handle 2-Piece Ladle 6 oz. $1.19 Winco LDT-4 Stainless Steel 2-Piece Ladle 4 oz. 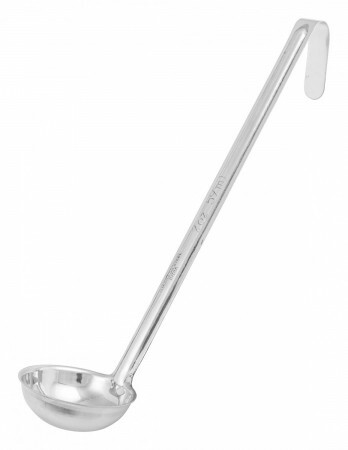 Complete your self-service area at your catered event with the Winco LDI-2 Stainless Steel 1-Piece Ladle 2 oz. Featuring a round-bottomed bowl, this ladle ensures consistent portioning while its long handle allows for touch-free service. Combining durability and convenience, this rust-resistant ladle is crafted from heavy duty stainless steel and has a hooked edge so it can be hung on a pot rim when not in use. 1-1/2 oz. - 3 oz.